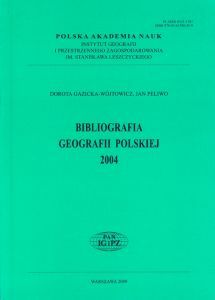 Bibliografia Geografii Polskiej (Bibliography of Polish Geography) has been published since 1935. Three volumes appeared before the WW2 as an addition to the monthly magazine “Wiadomości Geograficzne” (“Geographical News”). In the years 1959-2009 41 volumes have been published in print version. At present Bibliography of Polish Geography is available on-line in the form of electronic database, prepared in the Central Library of Geography and Environment Protection IGSO PAS. Currently it includes items from the years 1985-2008.